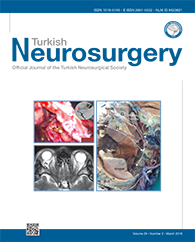 3Health Sciences University, Bagcilar Training and Research Hospital, Biochemistry Clinic, Istanbul, Turkey DOI : 10.5137/1019-5149.JTN.18585-16.1 AIM: To evaluate the protective, and if found to be effective, the therapeutic effects of Alpha lipoic acid (ALA) on functional and biochemical parameters in an experimental model of crush peripheral nerve injury in rats. MATERIAL and METHODS: Twenty-eight Sprague-Dawley rats were divided into four groups: In Group 1 (sham group), the sciatic nerve was explored but another procedure was not performed. Sciatic nerve crush injury was performed with aneurysmal clip application after physiological saline injection intraperitoneally in Group 2 (control group), and samely, sciatic nerve crush injury was performed with aneurysmal clip application following ALA injection in Groups 3 and 4. In all subjects, the Sciatic Functional Index (SFI) was calculated with Walking Track Analysis before and after nerve injury. All subjects were sacrificed 1 hour after sciatic nerve injury in the first three groups, and 48 hours later in Group 4, and then sciatic nerve tissue samples were taken. Superoxide dismutase, catalase and glutathione peroxidase activities were evaluated in these samples. RESULTS: Values of SFI of Group 1 were significantly higher than the results of Groups 2 and 3 (p=0.001 and p=0.004, respectively). Results of SFI of Group 2 were significantly lower than the results of Groups 3 and 4 (p=0.002 and p=0.003, respectively), and also, results of SFI of Group 3 were significantly lower the results of Group 4 (p=0.018). However, values of SFI in the sham group were not significantly different than the values of Group 4. Administration of ALA before nerve injury provided significantly higher levels of three antioxidant enzymes in sciatic nerve tissue compared to the levels of the control group. In addition, antioxidant enzyme levels were significantly higher 48 hours after injury than levels measured 1 hour after injury (p=0.002 for all three enzymes).